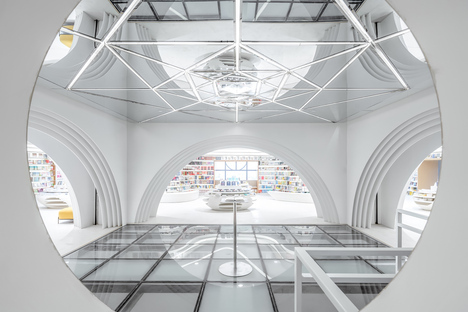 Shanghai-based architecture studio, Wutopia Lab recently completed a bookstore of the Zhongshu chain in Xi'an, one of China's oldest cities, and the capital of thirteen dynasties. Architecture that transcends routine with a sense of wonder, and supports urban regeneration. Bookstores have always been places where we can get away from routine at least temporarily, and engage with a creative - or perhaps more accurately a parallel - universe. The latest project by Wutopia Lab, the Shanghai-based architecture firm founded by Yu Ting that focuses specifically on a contemporary Chinese aesthetic, is located in Xi’an, one of China's oldest cities - the capital of thirteen dynasties - whose metropolitan area is now home to 12 million people. It is the starting point of the Silk Road and home to the Terracotta Army of Emperor Qin Shi Huang. The design and construction of the Zhongshu Bookstore, which took 600 days, is valuable to the city not just as a commercial venture but also architecturally, representing as it does the great urban revival that Xi'an is experiencing at the moment. This is also why its design references local history - a tribute to a white Divine Comedy in the capital of thirteen dynasties. To put the accent on a visit to the bookstore as a break from routine, Wutopia Lab created a cuboid, mirror-lined entrance on the fourth floor of the Xuhong Plaza building. A curved, white, wide floating staircase, surrounded by white acrylic walls and guided by white spiralling panels, takes readers to the bookstore's second floor. Each step of the way, they are drawn upwards and outwards into this knowledge-filled, white world. 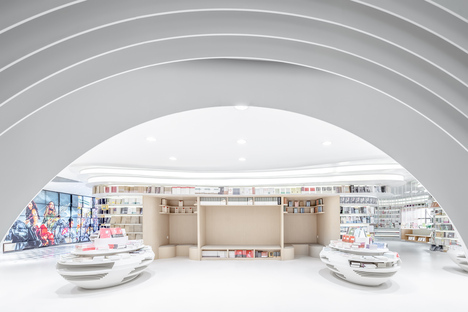 A cloud-like ceiling evoking an ancient Chinese legend caps off the bookstore, and to comply with fire codes, the architects opted for steel plate to craft the 3000-metre long curved bookshelf. A masterpiece that lies on the cusp of creativity and digital technology. Indeed, the architects needed to make very precise structural calculations for the steel frame hidden behind the foundation and supporting the white cantilevered bookshelf. Each part of the bookshelf was CNC machined then assembled in situ. This ten-level floating bookshelf sweeps around the store to craft a streamlined, warm reading space, an experience for visitors as innovative as the concept of this bookshelf sculpture. Still, the almost surreal world of the Zhongshu bookstore in Xi’an doesn't just offer reading material, the area also includes a lecture hall and cinema, with food service, to bring together all the activities. And one of the true gems of this already visually dramatic bookshop is the children's zone. Wutopia Lab designed a whole world for youngsters as part of the Zhongshu Bookstore, a zone with hide-and-seek entrances leading into a children's wonderland: a crystal structure hidden in the forest, described by the silhouettes of animals protecting the children. A clear reference to Chinese literature, for example, the deer that symbolises immortality. As Yu Ting, the founder of Wutopia Lab says, the purposes of this bookshop, whose full name is White Comedy of Xi’an Zhongshu Bookstore, is to turn our routine world into a world of magic, where we can discover the miracle and wonder hidden even in our ordinary lives. Because the space in this dazzling white floating bookstore gives us the opportunity to find a way into our own, personal wonderland. Construction Team: Shaanxi FuLei Decoration Design Engineering Co., Ltd.